They say a picture is worth a thousand words… so here are 4000 words! Here are some samples of what you can do for our BIG /small challenge. ..a big quilt, with one BIG star. Special thanks to Shirley and Fabric Spark/ Country Clothesline who are now selling this as a kit! … and here is another version: a big quilt with a small star. If you want to take part in the 12 x 12″ portion of this challenge, here is a 12″ quilt- a small quilt with a big message. Thanks, Ann! First the small version so you can see it IS small, then a close up so you can see her work. Note: Interested in taking a workshop? Sign up before June 1st, and you may win 2 tickets to Leni’ Levenson Wiener’s trunk show on Saturday July 28th. 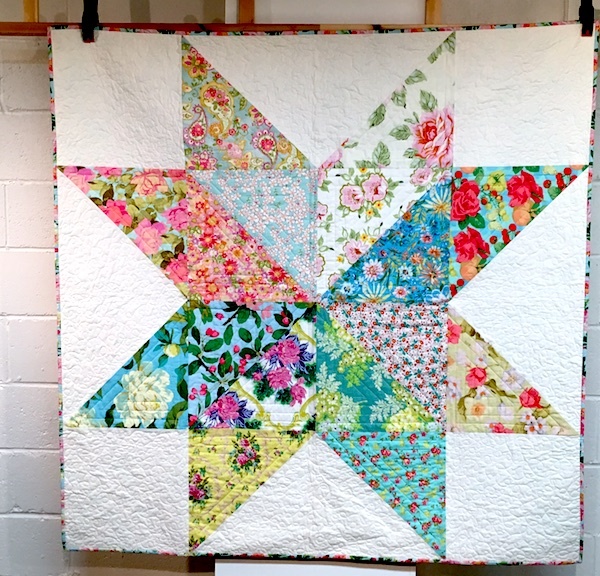 Quilt application forms are now available online, so enter soon and enter often! Yes, as the leaves fall from the trees and we quilters hunker down for a winter in our sewing spaces, thoughts turn to next summer’s Quilts at the Creek. 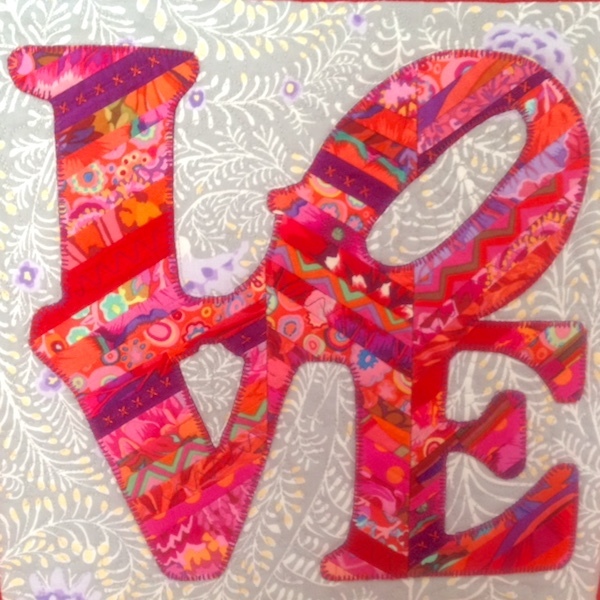 We love -and display- all kinds of quilts at our show. But some people like a challenge, and we are always happy to oblige. What is next year’s challenge? Who is teaching workshops? What shall I make? Our challenge this year is BIG / small. Interpret this as you wish- What?? A small quilt, with a big message (world peace?) This should be a 12 x 12″ quilt, and we will hang them together. 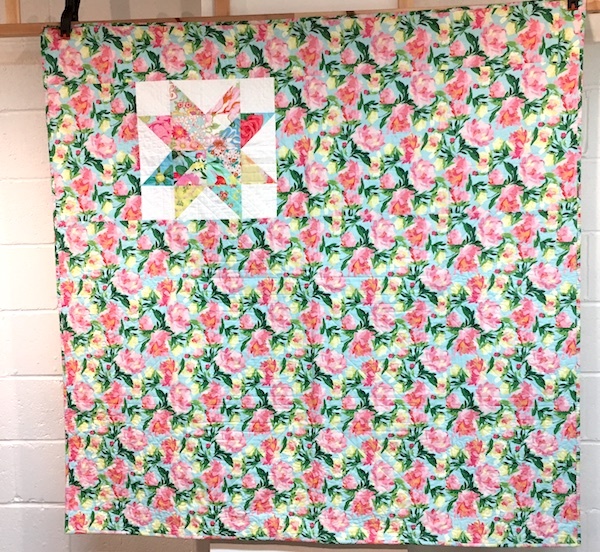 A large quilt with small blocks. Or one big block. Your choice! Big and small in one quilt.. hmmmmm need to think about this one. Our workshops this summer will be led by Leni Levenson Wiener. I LOVE her work, and can’t wait to meet her in person, see her work and attend her trunk show. Sneak peak of her work can be seen here. Details and online sign ups available in early January. Do you have a dream teacher you would like to take a workshop with? Workshop instructors are booked years ahead, but we are always interested in your input- you never know, they just might be available and fit into our schedule! 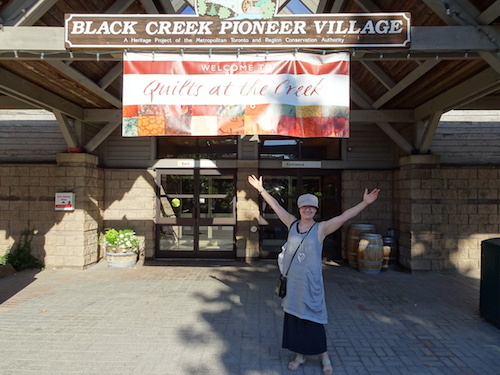 Or do you have favourite local quilter that you would like to see give a trunk show at Quilts at the Creek? Click here to send us an email with your suggestions!. Or leave a comment in the box below. Happy quilting, and don’t forget to mark your calendar for next summer: July 28 & 29, 2018. 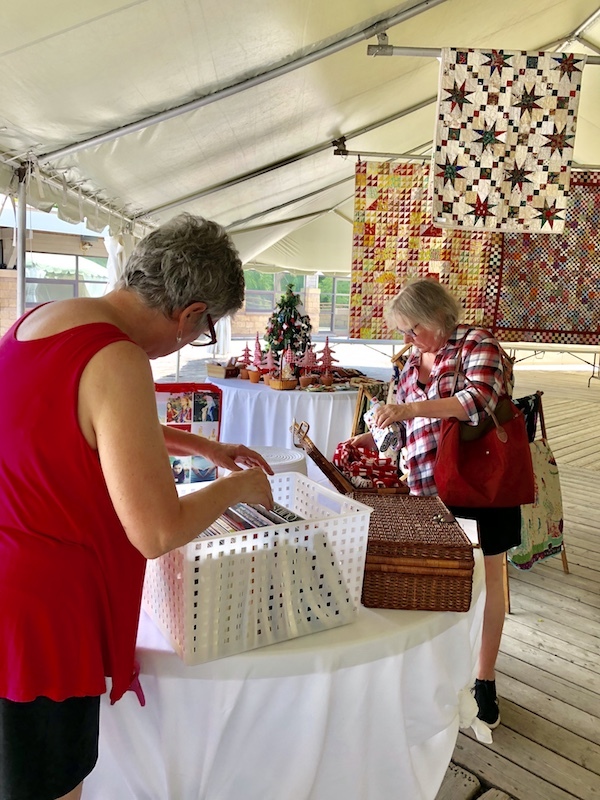 Did you miss Quilts at the Creek last weekend? Or do you just want to sigh over all those wonderful quilts one last time? Wait no longer, see photos here. Want to find out more about next year’s show? Sign up by clicking on the button to your right: “Sign Up Here for Updates”. Well, the show is over for another year, and we are all in recovery mode. But meanwhile I thought you might like a peak at the quilts celebrating Canada, and all the red and white quilts that we had on display (OK, I hope I didn’t miss any!). Click on the first one for a slideshow. 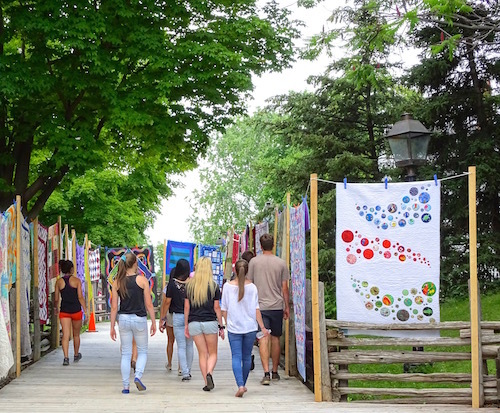 If you have never been to Quilts at the Creek, this is the year to be there! The weather promises us sunny skies this Saturday and Sunday. 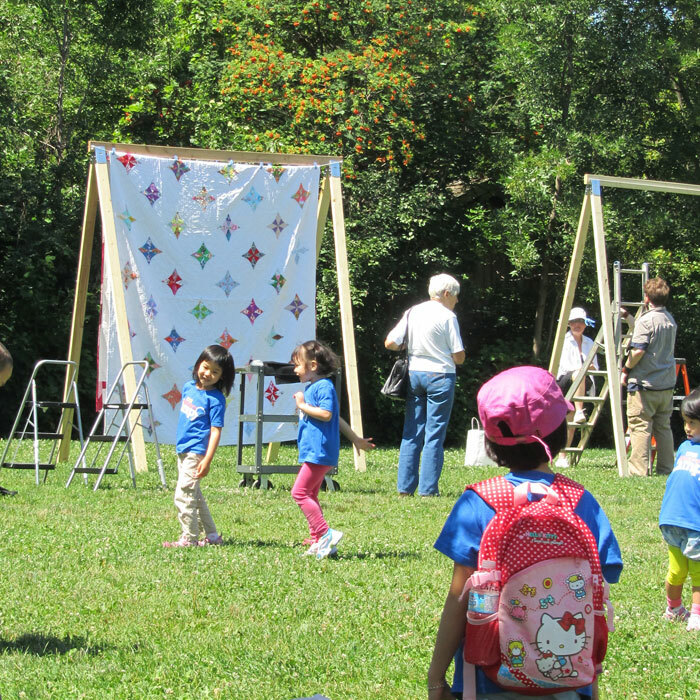 There will be hundreds of quilts throughout the park, vendors selling fabric and quilt kits, hand quilting demos (check out the group of Afghani children working on their hand work!). There are lots of places to wander and check out the historic buildings, farm animals to pet, and food trucks: Gourmet Gringos selling tacos and another selling ice cream. There are trunks shows you can attend*, and Laura Coia (Canadian Youtube sensation of SewVeryEasy) doing a meet and greet from 1 – 2:30 pm. *Saturday’s trunk shows by our guest workshop leaders Cheryl Arkison of Calgary and Tamara Kate of Montreal are $10 each, and Sunday’s workshops are by local up-and-coming quilt designer/artists are free. Details here..
Park hours 11 am to 5 pm…see you there!